For Today’s lesson I’ve chosen another great scene/quote from Lord of the Rings. Two scenes in particular. Let’s focus on the first one for today and get back to the second one another time. This quote holds true now even more than ever. We all wave the wand of judgement too easily these days. We proclaim to know exactly who are the valuable, revered, worthless, good and evil people in this world. We all too conveniently know who is valuable and who isn’t. We seem to have all the answers and know exactly what to do and when it needs to be done. This quote from Gandalf questions our arrogance and challenges us to rethink what we think we know to be right. Sometimes what we think is just and fair and honest simply isn’t. The person in question in this quote is the creature Gollum. At this stage in the story of the ring he certainly was not known for his honorable deeds or feats of bravery. He is a miserable creature that killed, lied and lived in disgust and self-pity since that fateful day he came upon the ring. Little did Frodo (and Gandalf) know how important the role will be that Gollum plays later. This is Gandalf’s exact words as well…He has some part to play. And he did indeed. As a matter of fact if it was not for Gollum the quest to destroy the ring would have failed. Remember Frodo may have shown tremendous bravery, character and determination to get the ring all the way to the cracks of mount doom but when the moment arrived…he couldn’t do it. He simply could not cast the ring into the fires of mount doom. It was there that he put the ring back on his finger and ran towards the exit of the mountain (surely to the eventual hands of Sauron). It was pure luck that Gollum arrived at that moment and actually managed to catch an invisible Frodo, byte the ring-finger off and rid Frodo of the ring for once and all. Are you brave enough to deal out death? Do you see all ends? This quote challenges me to question my own certainties and convictions on what I think is right and wrong. Who is good and/or bad? What is good and/or bad? 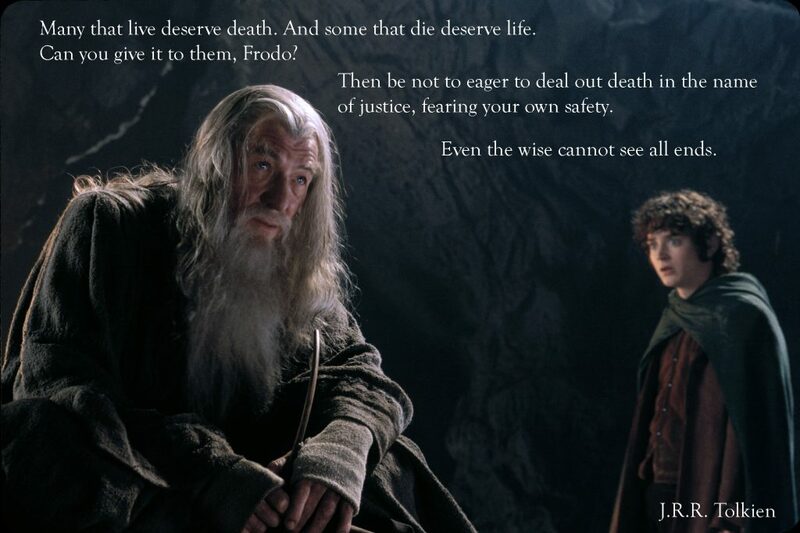 Matters such as death and life are too valuable to be put in the hands of men and we must not mettle with it. If you cannot create it then who are you to take/kill it? There’s a mystery in this world we do not understand yet and things move and change like the ocean’s tide and so often reveal itself only as a partial truth. May we all be open to another truth and be slow to pass judgement on who lives and who dies.